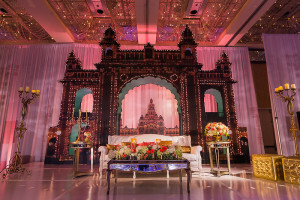 There wasn't one thing about Meghana and Salil's gorgeous wedding that wasn't perfect. This awesome couple's reception featured thousands of crystals (from both the chandelier centerpieces and the chandeliers in the gorgeous ballroom). Take a look at more breathtaking images from Lin & Jirsa Photography below! 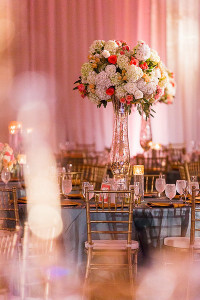 One of my favorite parts of this reception came in the form of our gorgeous chandelier centerpieces. They sat high above the tables and glimmered in the light- absolutely dazzling! 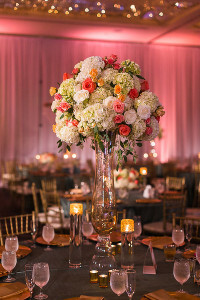 At the base of the structure sat a collection of lush florals and floating candles. Our glowing floating candles are always a hit at any event we do, and we love it when we're able to add a little pizazz to them! For Meghana and Salil we added a beautiful custom ribbon treatment to the tops of every cylinder. They added a beautifully soft and simultaneously ethnic glow to the event! The couple's backdrop was a masterpiece in and of itself- hands down! It glimmered with real lights and brought a very royal atmosphere. 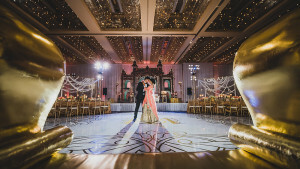 In front and to the sides of Meghana and Salil sat coordinating florals intermixed with more floating candles and tall, golden candelabras. Aren't these chandelier pieces the most breathtaking things you've ever seen?! We still swoon when looking at them, especially at a venue as naturally opulent and beautiful as the Hyatt Regency Long Beach. 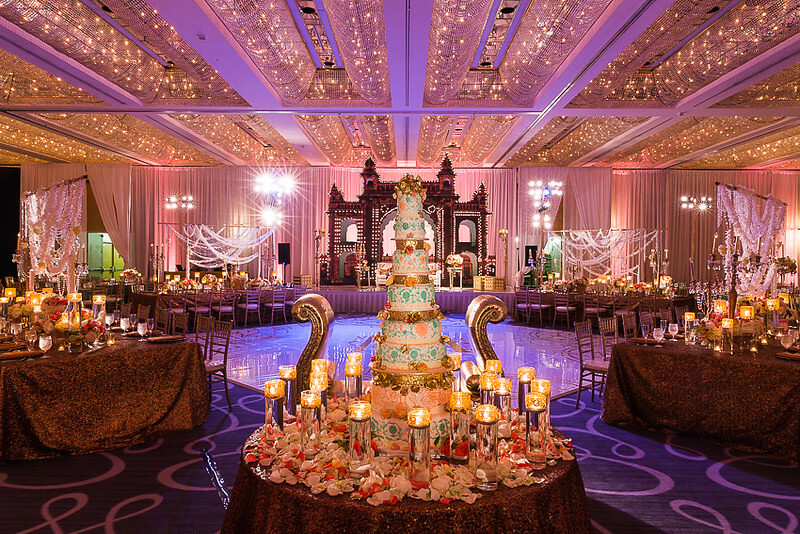 And although they aren't necessarily easy to see in these pictures, Meghana and Salil's long tables featured our tall t-structures draped in crystals, crystals, and more crystals along with different garlands. They reflected the lighting so perfectly! And then of course there's Meghana and Salil's amazing sangeet! 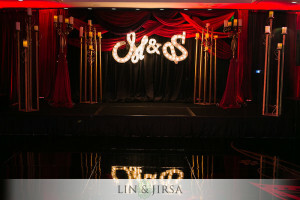 Draped from floor to ceiling in a deep red, dramatic fabric, this event was to die for! We made a custom backdrop for the couple (just take a few seconds to appreciate the gorgeous draping behind the marquee letters). Their initials practically illuminated the entire room and dazzled guests alongside our tall and equally dramatic golden candle stands. Weren't they just the cutest couple?! 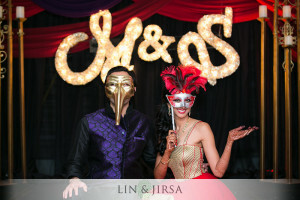 The masquerade look coordinated with the golden illuminated custom marquee letters so wonderfully! 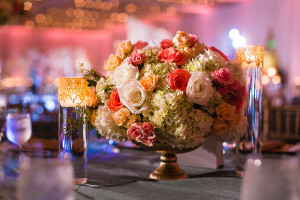 And the lounges featured our gorgeous golden goblets filled with water and large, blooming red roses. 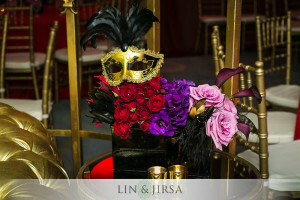 Our florals consisted of various pink, purple, and red flowers with dark and sultry feathers and masquerade masks. So fun!